In 2015 I was commissioned to create 5 sculptures riffing off of the themes in Henri Matisse’s painting “La Danse.” I knew I wanted to represent moving water in my interpretation, and the months that ensued between being commissioned and delivering the sculptures were filled with a maddening course of experimentation with materials, resin casting, and finally, perfecting a method of creating a “splash” effect in epoxy resin. In this tutorial I’m going to show you how to make resin look like it’s splashing out of a vessel. Note that if you prefer a video format scroll to the end of this post for a video version of this dimensional resin casting method. Resin naturally looks kind of like water when you put it in a vessel but I have a method that creates the final effect that makes it look like the resin is splashing out. 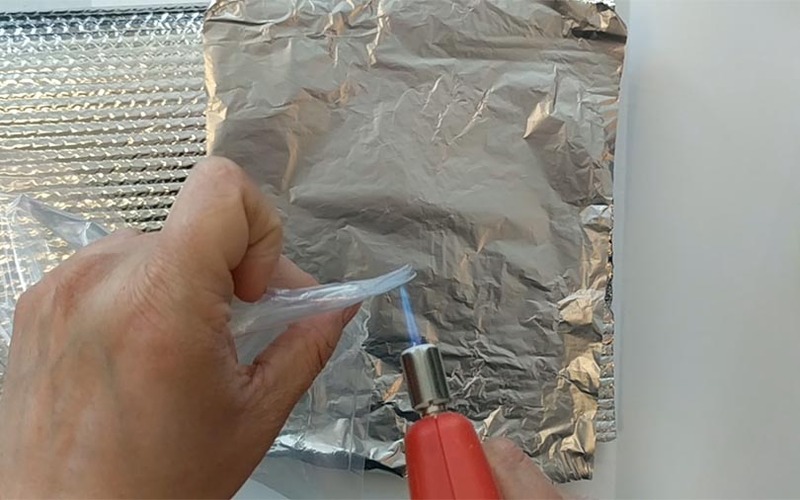 NOTE: this tutorial has been tested on Environmental Technology’s Easy Cast Epoxy Resin Results may vary if you are working with polyester Resin. 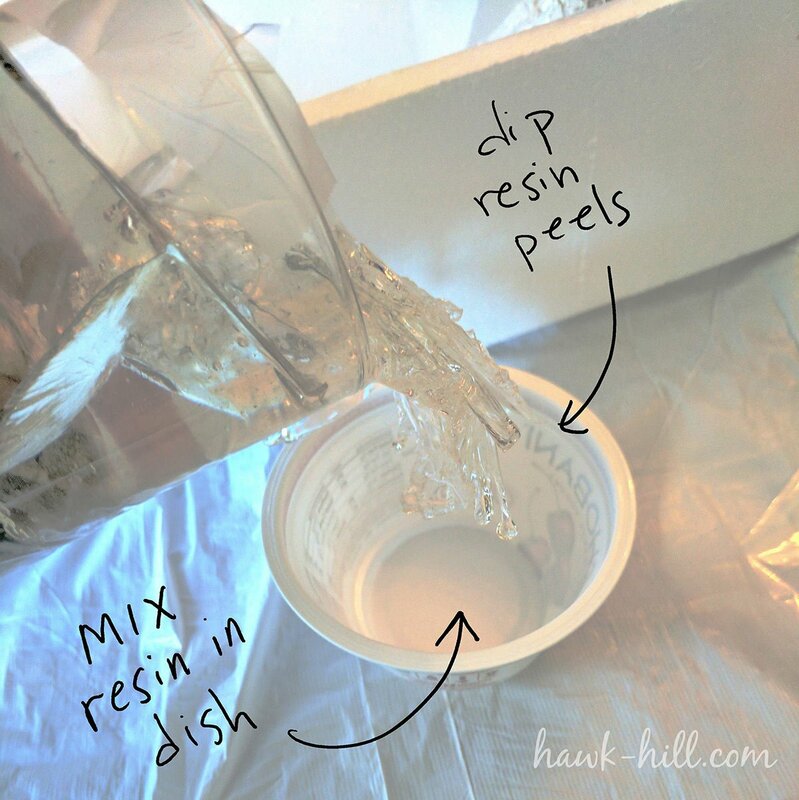 The first step to making resin splashes is actually to make some sheets of resin that they can be shaped. Initially, I experimented with pouring resin sheets in puddles and it was a *disaster* – so here’s my revised method, which worked for these sculptures. 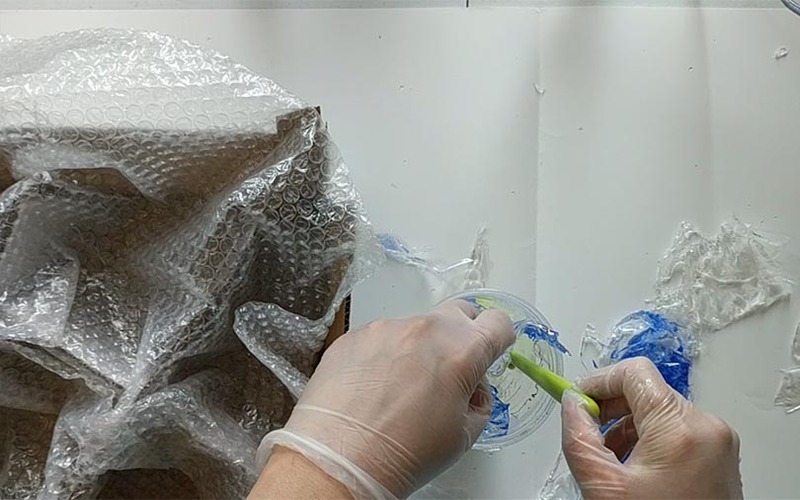 I make my own plastic bags in custom shapes and fill them with small amounts of resin and let them lay on their side while the resin cures. When the resin is hard (or in the 24-48 hour cured-but-not-hard state) I peel the plastic off. I use a little kitchen torch and some 2 mil plastic bags to make a more natural shape (2 mil refers to the thickness of plastic, most kitchen bags are thinner and will tear instead of pulling away from the resin when cured). 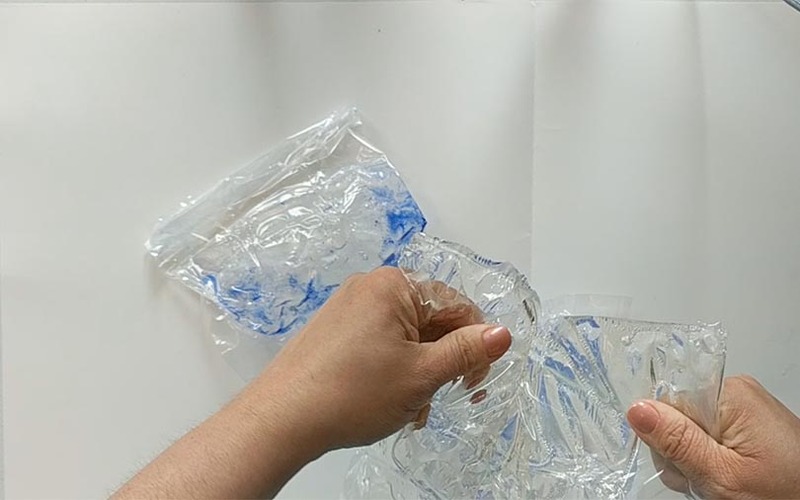 Create organic shapes and feathered edges by folding and then melting your bags around the edges. 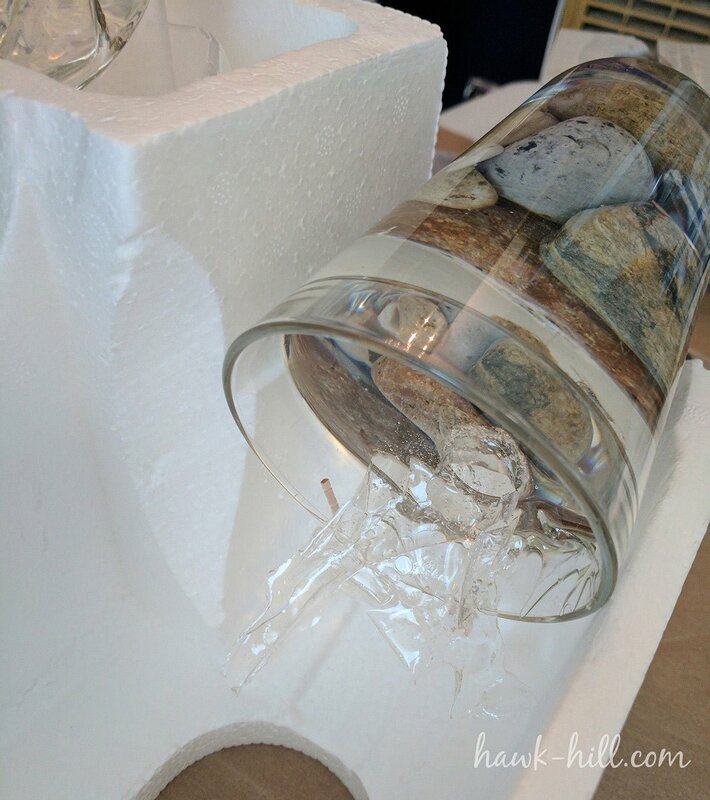 If I poured my resin into a square bag it would cure in a very unnatural shape – not at all like water- by shaping a bag by melting, I can create more organic shapes that work well for creating a base to build water splashes on. This method allows me to create some natural spots on the edge where the resin will actually seep through a little bit and create both variance in thickness and feathery edges. Pouring only an extremely small amount in each bag ensures that the cured sheet removed from the bag will be thin enough to bend, shape, and trim to the exact shape you need. ** BE VERY CAREFUL when using open flame and heating plastic. Work in a fire-safe, well-ventilated area, protect your body, your working surface, and anything flammable nearby. In this next step, I’ve already filled by bags and allowed them to cure for 24 hours. I put a bit of blue pigment in these for the sake of making photography easier, but prefer my resin splashing water sculptures to be clear, with no pigment added. These thin, textured sheets are ready to cut, bend, and mold into what will become waves and splashes. 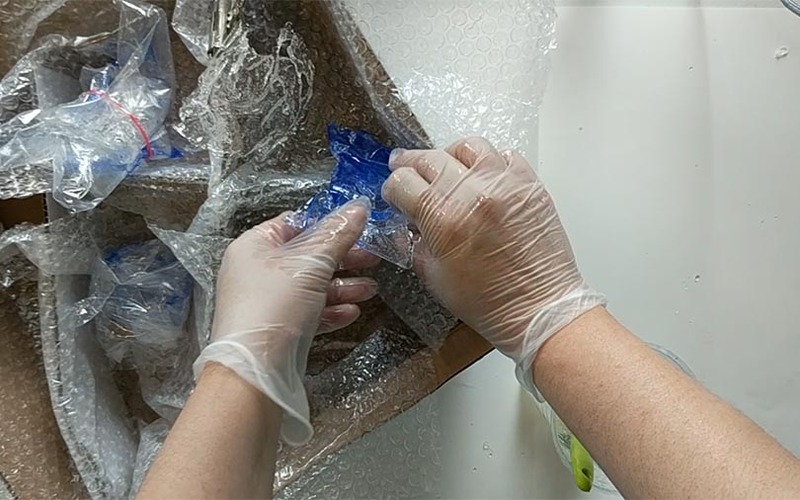 Once unwrapped from the bags, I take the sheets of resin, cut them to size (if needed), bend them into a wave-type shape, dip them in a fresh batch of resin, wrap them in more 2mil plastic to force the resin to cure in a dimensional shape, and add a rubber band around the wrapping to hold the wave in place. Bend the cured resin sheet into shape and dip into fresh resin. *Your hands will get coated in resin at this point. You MUST use gloves made for chemical handling or kitchen cleaning gloves for this part. I just laid it down on a flat surface it would immediately go flat again and I would just have sort of flat chunks of resin so in this method I’m creating volume and texture. In this way, I’m actually just creating resin layers and textures to build from later. Not all pieces will be used in a project, but making lots of waves gives me plenty of options to chose from in the next step when I’m building a splash. In the next steps I take a little resin wave and place it into a cup or a vessel that is already half-filled with a cured layer of resin. I put my resin wave sculptures towards the side and I pour another layer of flat resin into the vessel. Once cured, the flat layer locks the dimensional resin sheet into place, so I can begin dipping the wave and actually creating a dripping and splashing appearance. This photo shows a midpoint in my project. 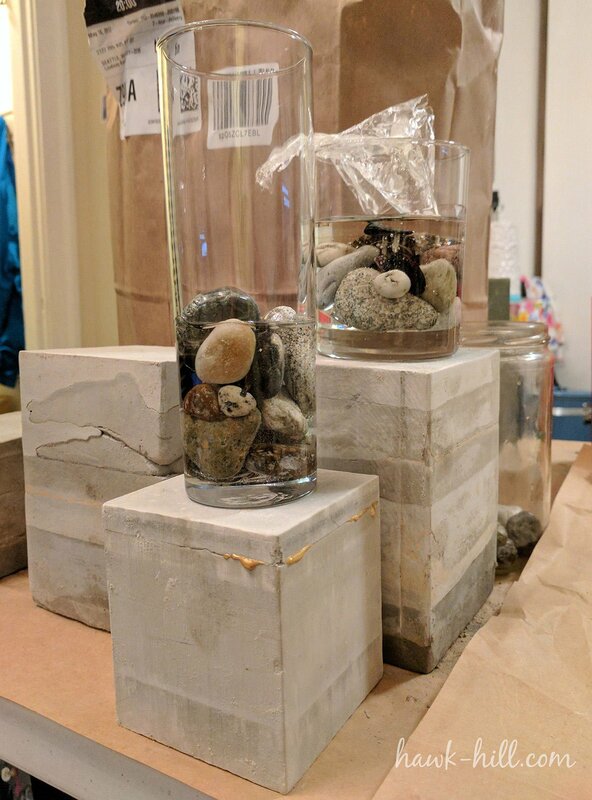 Vessels with sealed stones have a layer of resin poured and cured, then dimensional pieces of resin are added and secured in place with a second flat-pour of resin. In the final steps, I’ll dip the resin wave that’s been cured into a cup into more freshly mixed uncured resin. Then I secure the wave-in-a-cup in an upside-down or sideways position to dry so the resin “flows” in the direction of the splash. It will drip- it should drip to create the texture- but it will make a big mess so have a very well protected surface ready. It’s by doing this through about five to seven rounds that I actually get a dimensional sculpture that looks like water splashing out of the container. This works well for art sculptures but I can imagine many more uses in various hobbies. If this has been helpful, please consider supporting this blog’s sponsors, buying me a coffee, or signing up as a patron to enable the creation of more art and DIY tutorials. I went through no less than a half dozen attempts at creating the effect of spilling, splashing resin before finding a method that actually worked. Among the techniques I could never get to work was: 1. Pouring and trying to sculpt surface during end of work time. 2. Sculpting splashes in polymer clay and then making molds from the sculpture in which to cast resin, 3, casting pliable sheets by free-pouring onto a flat surface, and 4, as I approached a successful method, casting pliable sheets in a container that transferred it’s texture and created an unrealistic finish. 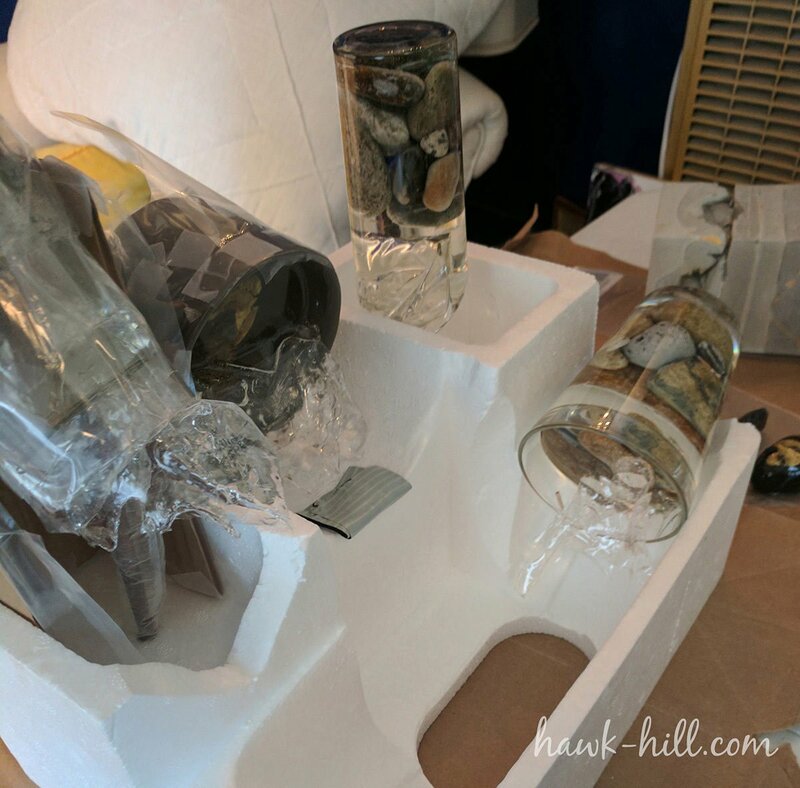 (optional) Allow the resin to sit in a warm space for 10-15 minutes (resin thickens as it approaches the end of the working window). As resin begins to thicken, stir vigorously with a sturdy stir stick to incorporate air bubbles into the resin. Zip bags and lay on a cookie sheet (or edged tray) on a completely level surface. 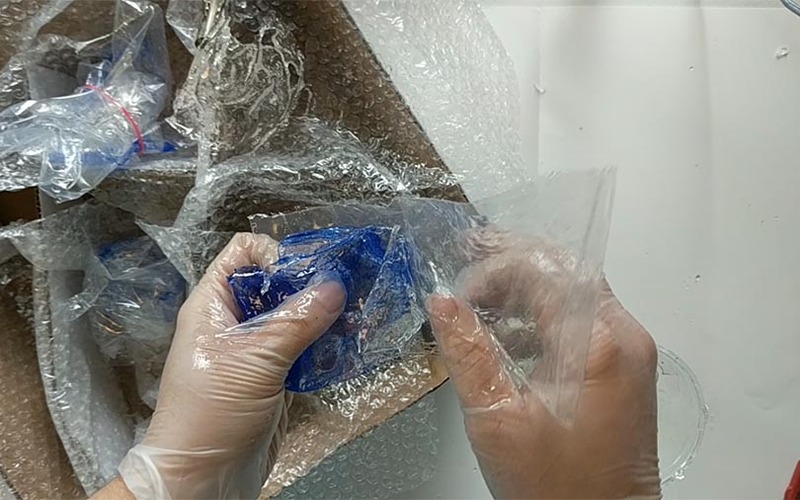 If your resin isn’t spreading thin on its own, use your fingers on the outside of the bag to press the resin to a thin pancake- a 1/8-1/4” thickness is ideal. 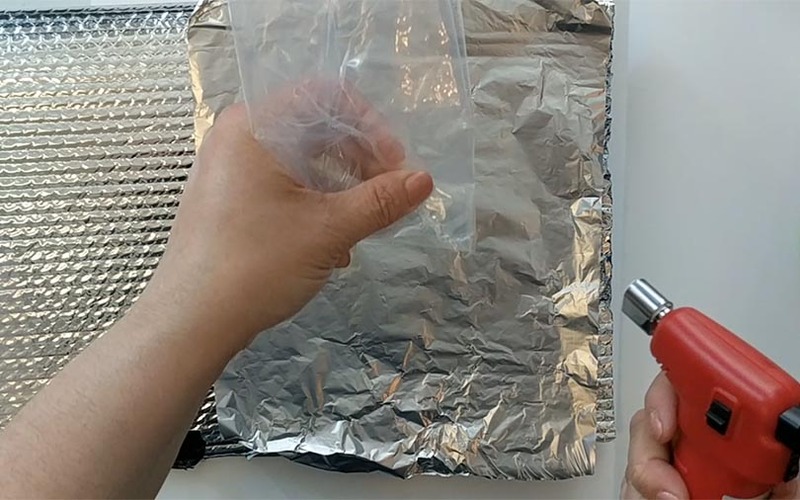 Use your fingers to slightly press the resin pooling inside the bags away from one edge. (the ideal sheet will have a slightly thicker base and a paper-thin upper edge, but intentionally making the curing surface unlevel tends to exaggerate what needs to be a slight effect. Allow curing 12-24 hours. Resin grows increasingly brittle in the 24hr-7day window, so make sure you keep moving on this project. 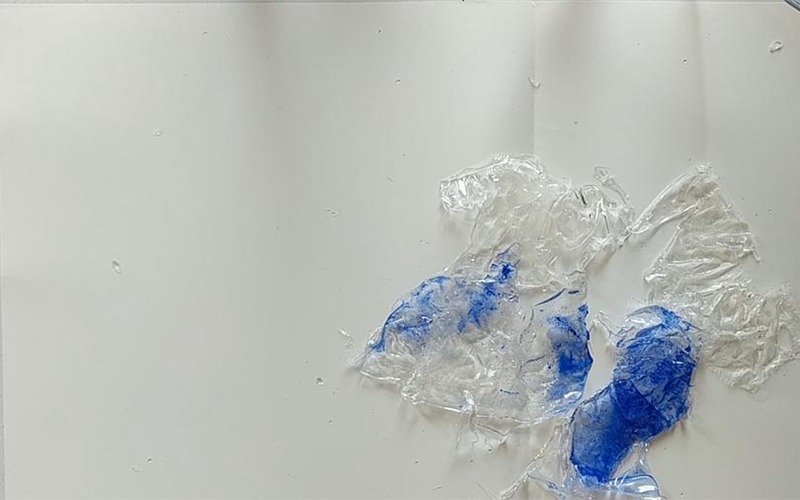 After 24 hours you can peel the plastic off the sheets of resin you’ve made. The result will be thin sheets of clear resin with naturally rough and uneven edges. Now, begin playing with the sheets you’ve made, shaping and experimenting with layers and bends to create the effect of water. More sharply rolling the bottom corners inward, to help the “wave” support its weight. 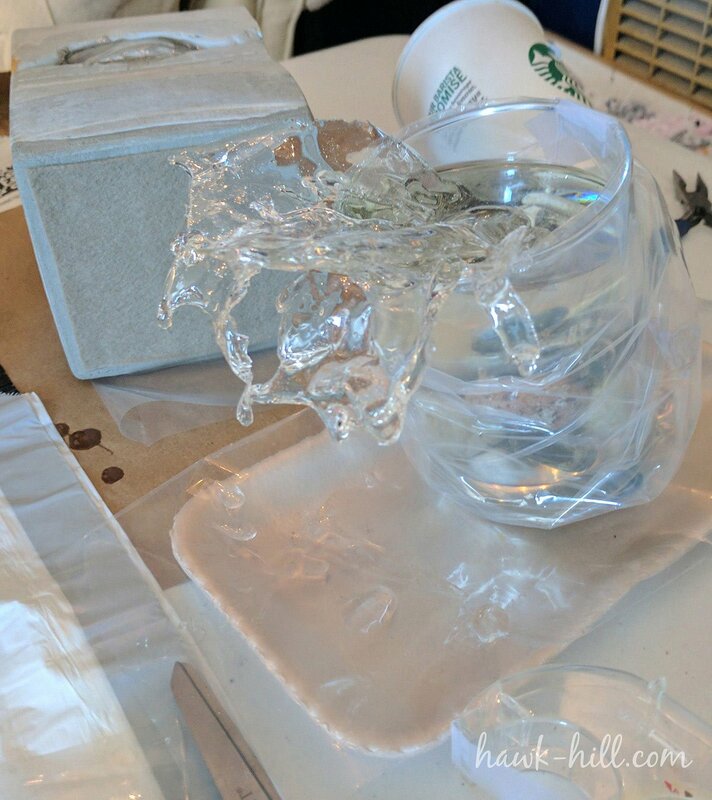 In 2017 I set out to create resin sculptures that emulated splashing water. Although I found some dramatic finished works that created this effect while I was researching, I was unable to find a tutorial- or even many hints- online on using resin as a medium to emulate moving water. Resin is frequently used to mirror the effect of water in art. It’s dimensionality and ultra-clear look when pooled and cured create, by default, the look of still water. 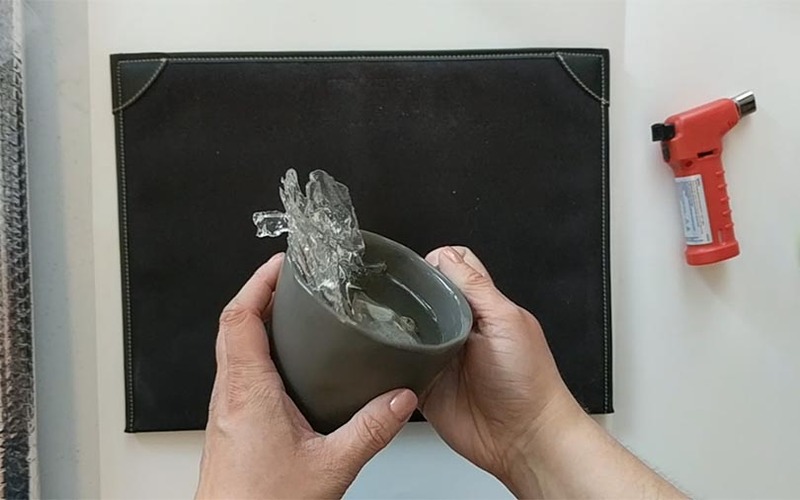 Creating the energy and dimensionality of moving water, however, is not what resin was designed for. Even though splashing, falling, and dripping effects are not a natural result of using expoy resin, Resin was the only material my research turned up that could create dimensional sculptures in ultra-clear material without the use of expensive and difficult to use glass blowing equipment. So I once I settled on using this media, I set out to experiment till I could master the effect with enough proficiency to use on the 5 splashing sculptures I’d been commissioned to create. Thank you !!! I’ve had the idea of resin and water in my head for a while but couldn’t figure it out and hadn’t found anything remotely close or as informative as this! I’ve been wanting to create waves with resin for a 3D effect on resin ocean pours. I saw your video tutorial on YouTube, but of course continued to search because, I suppose we all want to find an easy way to look like a genius. I came across this article and thought, ok, there is no easy way to get the effect, and as for looking like a genius… I don’t think a tutorial can do that for me. Thank you so much for the tutorial! I’ve been looking forever for such a guide… one question… are you please with the resin you work with? is it flexible enough? is it clear and not yellowing in time? is there anything better in the market today? It worked for my project! I’d encourage trying out other resins and methods to see if my method can be improved on further!